In memoriam, his family established the F.A. Gilfillan Memorial Award for Distinguished Scholarship in Science. The purpose of the award is to recognize distinguished scholarship in science by honoring a faculty member in the College whose scholarship and scientific accomplishments extend over a substantial period of time at OSU and are widely recognized by peers. The winner of the award receives a plaque presented at the annual College of Science Faculty and Staff Awards Day, a stipend, and an opportunity to present their research in a public lecture. The title of Distinguished Professor is the highest designation and academic honor that OSU bestows on our faculty. These titles have been awarded annually since 1988 to recognize outstanding active OSU faculty members who have achieved national and/or international stature as a result of their contributions to scholarship/creative activity, research, education, and service, and whose work has been notably influential in their fields of specialization. Come join us in celebrating the College of Science scholarship recipients for the 2013-2014 academic school year in all departments. You will have the opportunity to meet the future of science innovation and learn more about the College’s Scholarship Program and how it benefits our students as they accomplish their academic goals. If you’re interested in attending any of these events or would like more information, please contact Jill Wells at 541-737-3882 or jill.wells@oregonstate.edu. Area elementary school age children visited Oregon State to participate in hands on science experiences. Read more in the Daily Barometer. When confronted with the life altering choice of where to go to college, Helen Hobbs knew that she wanted to study at a university that offered more than just lectures. 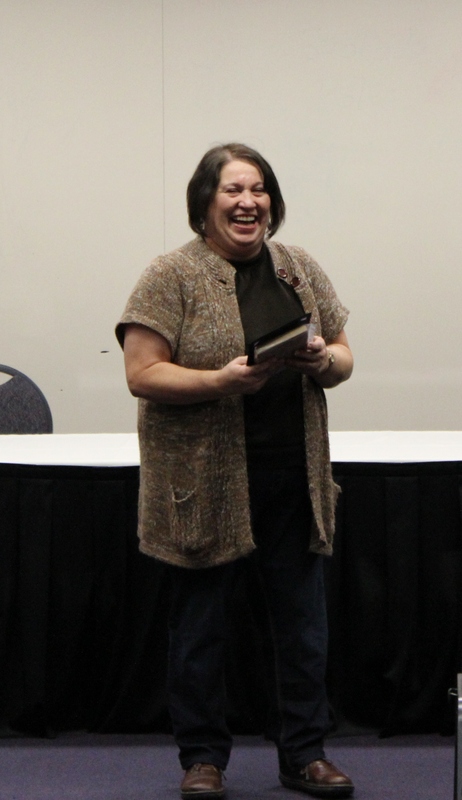 This revelation guided Helen to Oregon State University and the beginning of a great research career. After her high school graduation, Helen packed up her bags in Butte, Montana and headed to Corvallis. Helen was the daughter of scientists and her own inquisitive mind was drawn to chemistry. She really enjoyed the idea of applying chemistry to biological systems. This fascination lead to her choice to study biochemistry in the College of Science at OSU. 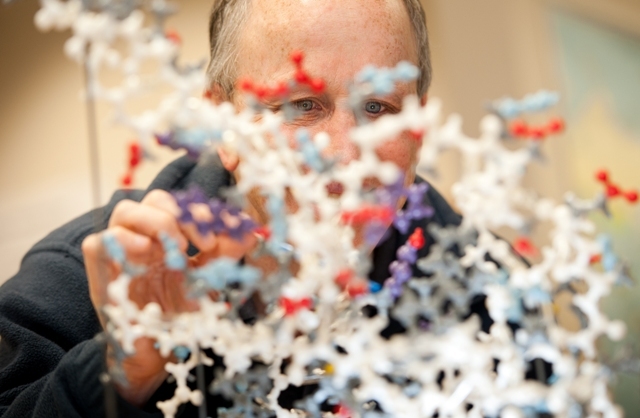 Biochemistry isn’t offered as an undergraduate major at many universities, and coupled with so many opportunities to conduct research as an undergraduate, Oregon State was a natural fit. Thanks to HHMI, Helen was able to work with Dr. Barb Taylor in Zoology during the summer between her freshman and sophomore years. At the Undergraduate Research Symposium she presented “Bacterial Colonization of Drosophila Larvae”. She enjoyed her time in Dr. Taylor’s lab, but wanted to do more cellular research and actually focus on her field of choice, biochemistry. Helen was driven to work with Dr. Tori Hagen of the Linus Pauling Institute. Helen’s project in the Hagen laboratory focuses on the protein aldehyde dehydrogenase 3 (ALDH3), which is secreted in human saliva in order to begin the conversion of reactive aldehydes, that can cause damage to proteins and DNA, into relatively non-toxic alcohols. ALDH3 is also of interest because it is linked to a transcriptional regulator, Nrf2, whose activity has been observed to decrease as organisms age, resulting in an increased susceptibility to oxidative damage. Feeding rats the dithiol compound, lipoic acid (LA), reverses the age-related loss of Nrf2 gene transcription. However, the effectiveness of LA in the Nrf2 mediated stress defense in humans remains untested. This is the aspect at which her research has been directed as she is measuring the quantity of ALDH3 and other stress response proteins in clinical saliva and white blood cell samples. Before being involved in undergraduate research, Helen was interested in becoming a medical doctor. Now she has found a passion in research and wants to continue this career trajectory by eventually obtaining her PhD so that she may teach as well as conduct research. 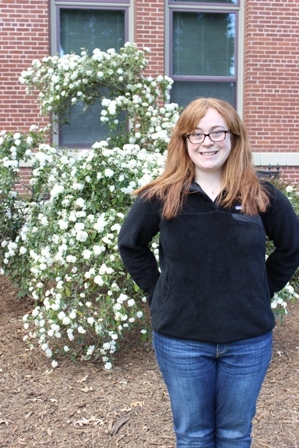 Her dream school for graduate studies is the Massachusetts Institute of Technology (MIT) and she will have the opportunity to experience what the campus has to offer as she will be spending nine weeks this summer at MIT for an internship. Don’t miss the Health Professions Career Fair on Tuesday, April 16th! Admissions representatives from over 50 health professions schools in Oregon and across the country are attending the fair and eager to meet OSU students. The fair will be open from 10:00am to 3:00pm at the LaSells Stewart Center. Students from all majors, freshmen through seniors, are welcome at this free event. Programs represented include medicine, dentistry, pharmacy, nursing, public health, vet med, PA, PT, OT, counseling, psychology, and more! Learn more here. OSU is pleased to announce its most successful year ever in competition for the prestigious Barry M. Goldwater Scholarship, awarded by the U.S. government to the top undergraduate student research scholars in science, math, and engineering. Each campus is allowed to nominate four students for the award and for the first time, all four students nominated by OSU were recognized by the national Goldwater selection committee – three with full scholarships and one with an honorable mention. Not only are the recipients all from Oregon State, but from the College of Science! 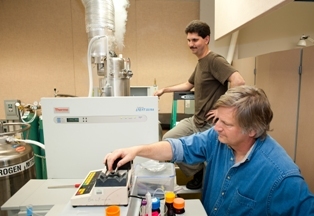 Oregon State College of Science students continue to raise the bar of excellence. Mrs. Peggy Goldwater Clay, Chair of the Board of Trustees of the Barry M. Goldwater Scholarship and Excellence in Education Foundation, announced today that the Trustees awarded 271 scholarships for the 2013–2014 academic year to undergraduate sophomores and juniors from the United States. The Goldwater Scholars were selected on the basis of academic merit from a field of 1,107 mathematics, science, and engineering students who were nominated by the faculties of colleges and universities nationwide. One hundred seventy-six of the Scholars are men, 95 are women, and virtually all intend to obtain a Ph.D. as their degree objective. Twenty-seven Scholars are mathematics majors, 159 are science and related majors, 71 are majoring in engineering, and 14 are computer science majors. Many of the Scholars have dual majors in a variety of mathematics, science, engineering, and computer disciplines. The one and two year scholarships will cover the cost of tuition, fees, books, and room and board up to a maximum of $7,500 per year. Goldwater Scholars have very impressive academic qualifications that have garnered the attention of prestigious post-graduate fellowship programs. Recent Goldwater Scholars have been awarded 80 Rhodes Scholarships, 118 Marshall Awards, 110 Churchill Scholarships and numerous other distinguished fellowships. The Goldwater Foundation is a federally endowed agency established by Public Law 99-661 on November 14, 1986. The Scholarship Program honoring Senator Barry Goldwater was designed to foster and encourage outstanding students to pursue careers in the fields of mathematics, the natural sciences, and engineering. The Goldwater Scholarship is the premier undergraduate award of its type in these fields. Since its first award in 1989, the Foundation has bestowed over 6,550 scholarships worth approximately 40 million dollars. The Trustees plan to award about three hundred scholarships for the 2014–2015 academic year. Spend the day in Newport, OR for the Hatfield Marine Science Center’s Marine Science Day on Saturday, April 13th. Sarah Henkel, a senior research assistant professor in the OSU Department of Zoology, will present an update of wave energy developments on the Oregon Coast at 3:00pm in the Visitor Center Auditorium. The College of Science is grateful to the donors and alumni. Not only do they generously support our students by donating funding to scholarships and undergraduate research, but they donate their time to help prepare students for their chosen fields. This is the case with Dr. Ryan Sparks. Dr. Sparks opened up his dental office to 40 pre-dental students to show them the intricacies of filling a cavity. Each student was provided with a denture tooth on which to work. This hands on experience provided the students with the opportunity to use the same tools that Dr. Sparks uses on his patients on a daily basis. They drilled on their teeth as well as filled them with the actual material used on patients, mercury and silver. The students had a small glimpse into what their lives would be like in dental school as Dr. Sparks told the pre-dental students that the activity they performed was much like the activities he practiced in dental school. Dr. Sparks examines the work done by OSU ore-dental student. CORVALLIS, Ore. – Researchers have discovered how oxidative stress can turn to the dark side a cellular protein that’s usually benign, and make it become a powerful, unwanted accomplice in neuronal death. This finding, reported today in Proceedings of the National Academy of Sciences, could ultimately lead to new therapeutic approaches to many of the world’s debilitating or fatal diseases. The research explains how one form of oxidative stress called tyrosine nitration can lead to cell death. Through the common link of inflammation, this may relate to health problems ranging from heart disease to chronic pain, spinal injury, cancer, aging, and amyotrophic lateral sclerosis, or Lou Gehrig’s disease. As part of the work, the scientists also identified a specific “chaperone” protein damaged by oxidants, which is getting activated in this spiral of cellular decline and death. This insight will provide a new approach to design therapeutic drugs. The findings were published by scientists from the Linus Pauling Institute at Oregon State University; Maria Clara Franco and Alvaro Estevez, now at the University of Central Florida; and researchers from several other institutions. They culminate a decade of work. “These are very exciting results and could begin a major shift in medicine,” said Joseph Beckman. Beckman is an LPI principal investigator, distinguished professor of biochemistry, and director of the OSU Environmental Health Sciences Center. He also last year received the Discovery Award from the Medical Research Foundation of Oregon, given to the leading medical scientist in the state. Scientists have known for decades about the general concept of oxidative damage to cells, resulting in neurodegeneration, inflammation and aging. But the latest findings prove that some molecules in a cell are thousands of times more sensitive to attack. In this case, heat shock protein 90, or HSP90, helps monitor and chaperone as many as 200 necessary cell functions. But it can acquire a toxic function after nitration of a single tyrosine residue. The very specificity of this attack, however, is part of what makes the new findings important. Drugs that could prevent or reduce oxidative attack on these most vulnerable sites in a cell might have value against a wide range of diseases. “Most people think of things like heart disease, cancer, aging, liver disease, even the damage from spinal injury as completely different medical issues,” Beckman said. “To the extent they can often be traced back to inflammatory processes that are caused by oxidative attack and cellular damage, they can be more similar than different. “It could be possible to develop therapies with value against many seemingly different health problems,” Beckman added. Beckman has spent much of his career studying the causes of amyotrophic lateral sclerosis, and this study suggested the processes outlined in this study might be relevant both to that disease and spinal cord injury. 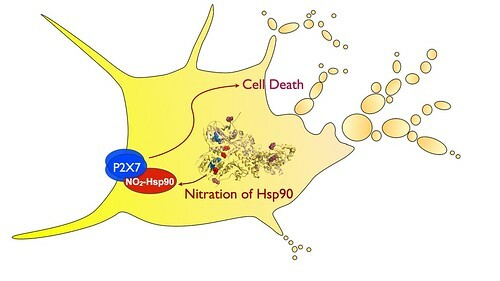 One key to this research involved new methods that allowed researchers to genetically engineer nitrotyrosine into HSP90. This allowed scientists to pin down the exact areas of damage, which may be important in the identification of drugs that could affect this process, the researchers said. This work was supported by the National Institutes of Health, Burke Medical Research Institute, Weill Cornell Medical College, the ALS Association and other agencies. Learn what the Pre-dental Society at OSU is doing off-campus by reading this Daily Barometer article by McKinley Smith.